Special dress collar only for Dgt. 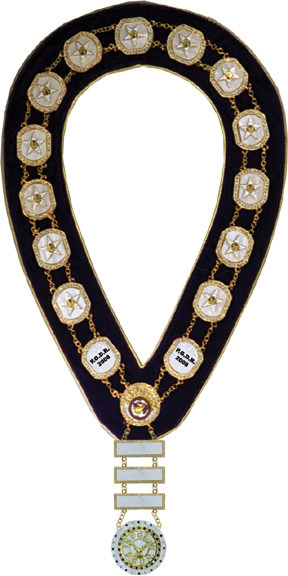 President of State Auxiliary. Stunning ladies collar with special features. Stone studded links with pearl centers and letters S T A T E going down both sides. Spaecial Medallion with Name of your state and STATE PRESIDENT on pearl with rhinestone circle. When calculating number of letters SUBTRACT 40 FROM THE TOTAL - do not count spaces or punctuation. EXAMPLE: TOTAL LETTERS = 63 - 40 = 23 . ENTER 23 INTO BOX PROVIDED.